Personal Facts: Apmann credited much of his victory to the help from other German poker players, noting the tightness of the local community is very beneficial to everyone involved. 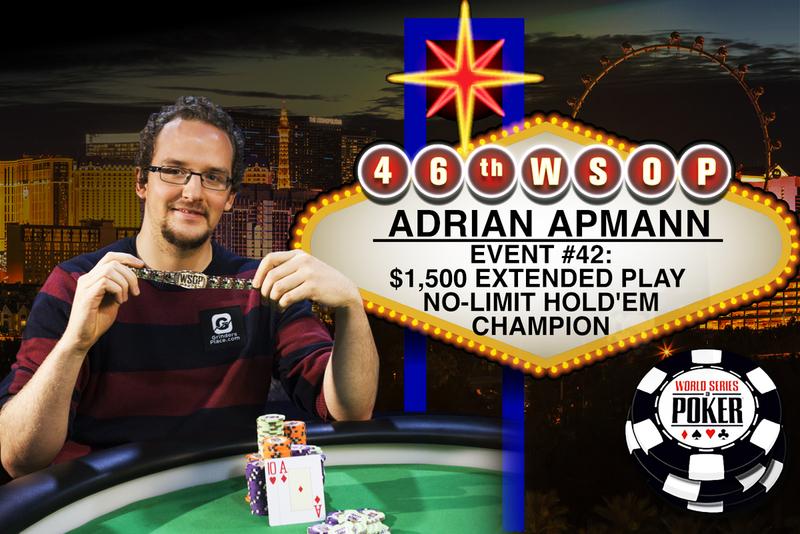 Adrian Apmann needed overtime to win the first-ever “Extended Play” tournament, which debuted at the 2015 World Series of Poker. The extra playing time and more hands dealt out per level was expected to benefit the most skillful players and bigger names, who given the chance to withstand inevitable dry spells during every tournament, would end up dominating the leaderboard. Give superior players longer time and more play, as the saying goes, the cream would rise to the top. At least that was the idea. Well, the cream didn’t just rise, it boiled over. Only, it took quite a long time to heat up. Apmann ended up winning the $1,500 buy-in Extended Play (No-Limit Hold’em) tournament, which drew a whopping 1,914 entrants in its WSOP debut. A tournament that normally would have taken three days to complete, was actually scheduled for four days, and then ended up running into a fifth, and final day that lasted nearly seven additional hours. After nearly a week of card playing, Apmann was the last player standing, or make that the last player sitting at the final table, which was played out to its conclusion on the ESPN Main Stage at the Rio in Las Vegas. The finale was streamed live online at WSOP.com. From the $2,583,900 prize pool, Apmann collected $478,102 in prize money. He also earned his first WSOP gold bracelet. Coming into this tourney, Apmann had five previous cashes dating back to 2012, but nothing stood out as a resume maker when it came to poker. Although he did cash in the 2012 Main Event Championship, his best showing here in the annual Las Vegas summer classic had been a 51st place showing. 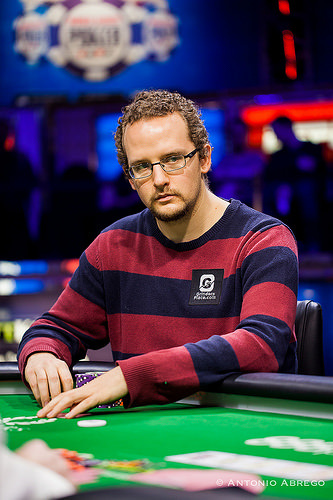 Apmann is a 25-year-old poker pro, originally from Ludwig, Germany, but now residing in Vienna, Austria. Prior to playing poker, he was a college student. Apmann moved to Austria in 2009 and immediately began gaining valuable poker advice from many German and Austria players, as the tight-knit community began to be a force in European tournaments. As German players increasingly enjoyed success at the WSOP, noticeably starting with Pius Heinz’s memorable world championship victory in 2011, and followed by repeated victories by Dominik Nitsche and George Danzer, Apmann also improved as a player. In fact, he credits many of the German players, some of whom now live and play in Vienna, with making him a better player. The final table included two gold bracelet winners – Barney Boatman (England) and Konstantin Puchkov (Russia). However, neither player could shake the German poker player from his lofty perch. Boatman certainly got deeper and seemed the experienced best in position to dethrone Apmann. However, Boatman, nor the second-place finisher, Yehoram Houri, could roll back the rising tide that eventually swept Apmann to victory. Indeed, the three-way match between Boatman and Houri on Day Five lasted nearly five hours, the longest stalemate of the entire series, so far. Apmann was never seriously threated during the three-way standoff, although both Boatman and Houri were anything but passive during the trio’s endurance contest. After Boatman’s bust out, Houri caught a huge break on a double up, with two overcards versus Apmann’s low pocket pair. But the last hand reversed things and gave Apmann the victory when his Ace-Ten bested Houri’s pocket 7’s after both an ace and a ten flopped and the board failed to change things. As for the generous structure and extra playing time, even though the tournament lasted a longer time than anyone could have expected, the grueling marathon was well worth the effort. When asked about how he got into poker, Apmann said his life was changed back in 2005 when he first saw coverage of the WSOP on German television. Like millions of other poker players around the world, he saw people like himself coming to Las Vegas and playing a game, sometimes making life-changing money. Indeed, it’s also pretty cool to win a WSOP gold bracelet and $478,102. Second Place: Yehoram Houri finished as the runner up. The director of a medical center from Paris (France) posted only his second cash at the WSOP, which paid out $295,727. He played a marvelous tournament over five days. Houri also has two second-place finish in European Poker Tour events. Third Place: Barney Boatman, from Hendon, UK (ala. “The Hendon Mob”), finished in 3rd place after playing three-handed for nearly five hours. Boatman was hoping to win a second gold bracelet, but instead had to settle for $204,464, the payout for finishing third. Boatman, who enjoyed his first WSOP cash 16 years ago, and won a gold bracelet in 2013, now has more than $1.2 million in WSOP earnings. Fourth Place: Anthony Diotte, a 28-year-old poker pro from LaSalle, Ontario (Canada) came in 4th. He’s won more than $2 million in online tournaments, as well as a victory on the Latina American Poker Tour’s High Roller event. This marked Diotte’s fourth time to cash at the WSOP, which paid $147,463. Fifth Place: D.J. Buckley, a 39-year-old professional gambler from Eden Prairie, MN took 5th place. This was his third cash of the year, which also included an in-the-money finish in the Monster Stack tourney. This was Buckely’s best WSOP showing, which paid out $107,800. Sixth Place: Kurt Lichtman, a 50-year-old hedge fund manager from New York City, came in 6th. He pocketed $79,842 in prize money. This was his third time to cash in a WSOP event, and first time to make a final table. Seventh Place: Konstantin Puchkov, from Moscow, Russia won a gold bracelet back in 2010 playing HORSE. He really gained notoriety in 2012 when he posted ten WSOP cashes that year. This marked the fourth straight year Puchkov has made at least one final table appearance. His payout amounted to $59,920. Puchkov, age 63, owns and trains horses when he’s not playing poker. Eighth Place: Artem Metalidi, from Kiev, Ukraine, ended up as the 8th-place finisher. He’s a 26-year-old poker pro who developed his craft by studying at PokerStrategy.com. Melalidi now has four cashes at this year’s series. His best previous showing was a runner-up finish back in 2012. Metalidi’s first final table appearance since that date paid out $45,554. After the tournament ended, winner Apmann said he thought Melalidi was the toughest player at the final table. Ninth Place: Ross Gottlieb, a 25-year-old veterinarian, had plenty to bark about by finishing ninth and making the final table in what was his first ever WSOP cash. He will undoubtedly be the cat’s meow back in his new vet practice, which opens up next month. Gottlieb, who recently graduated from Ohio State University, took his share of the prize pool amounted to $35,063. Aside from the final table finishers, other gold bracelet winning players who cashed included – Antonio Esfandiari, Lisa Hamilton, Blaire Hinkle, Todd Witteles, Ryan Welch, and Andre Akkari. John Strzemp, a casino executive from Las Vegas (Wynn) cashed, finishing in 27th place. He’s best known in the poker world for finishing as runner up to the late Stu Ungar in the 1997 WSOP Main Event Championship. Poker pro and author Jonathan Little cashed for the 29th time in his poker career. Poker author James McManus (“Positively Fifth Street”) cashed in this event. Yehoram Houri limps in, and Adrian Apmann makes it 380,000. The action is back on Houri, he moves all-in and Apmann calls. The flop brings Apmann in the lead. Houri needs help or his tournament is over. The turn and the river doesn’t change anything. Yehoram Houri is eliminated in second place for $295,727. Adrian Apmann is the winner of Event #42: $1,500 Extended Play No-Limit Hold’em. 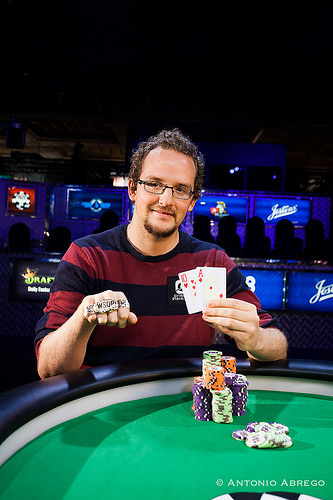 Apmann receives $478,102 and his first WSOP gold bracelet. Adrian Apmann raises to 255,000 on the button. Yehoram Houri shoves all-in and Apmann folds. Adrian Apmann gets a walk. Adrian Apmann opens for 255,000 and takes the pot. Yehoram Houri calls and Adrian Apmann checks and the flop is [ptc] . A bet from Yehoram Houri wins the pot. Adrian Apmann makes it 255,000 and takes the pot. Yehoram Houri gets a walk from Adrian Apmann. Yehoram Houri raises to 255,000, Adrian Apmann snap folds. Adrian Apmann makes it 255,000 on the button and Yehoram Houri folds his big blind. Adrian Apmann gets another walk from Yehoram Houri. Adrian Apmann raises to 255,000 and Yehoram Houri calls. The flop is . Houri checks, Apmann bets 200,000 and that’s enough to win the pot. Adrian Apmann makes it 255,000 and Yehoram Houri calls. The flop is and is checked. The turn is the and Houri bets 200,000. Apmann lets it go. Yehoram Houri moves all in and wins the pot. Adrian Apmann raises and takes it down. Yehoram Houri shoves all-in on the button for 1,225,000 and Adrian Apmann calls in the big blind. The is good for Houri, he makes top pair. The turn gives the players a sweat. Every heart and every two is now good for Apmann. The river secures the double up for Yehoram Houri. Adrian Apmann gives Yehoram Houri a walk. Yehoram Houri folds his small blind and Adrian Apmann gets a walk.